RAFINA, Greece -- Wildfires raged through seaside resorts near the Greek capital of Athens, torching homes, cars and forests as they killed at least 74 people, authorities said Tuesday. Twenty-six of the dead were found huddled together in a compound, while a few bodies were recovered from the sea where they had fled to escape the flames and smoke. Greece endures wildfires every summer but the fires that broke out Monday were the deadliest to hit the country since 2007. Fueled by gale-force winds, they trapped hundreds of people on beaches, roads and in homes. Prime Minister Alexis Tsipras declared three days of national mourning. There were fears the death toll could rise even further, as there was no definitive count of how many people were missing. Although the fires had largely abated by Tuesday afternoon, they were far from out. Hundreds of firefighters aided by water-dropping aircraft were tackling the remaining areas in the two main blazes near the capital. One was northeast of Athens near Rafina, where most of the casualties appeared to have occurred, while the other was about 30 miles west of Athens, where some flare-ups were reported Tuesday afternoon. Four other fires were burning in other parts of the country, including near Corinth and on the island of Crete. Coast guard boats patrolled the shores near fire-hit areas Tuesday after more than 700 people trapped by quick-moving fires had to be rescued from beaches or the sea, where six of the dead were found. Defense Minister Panos Kammenos said 88 people had been picked up from the sea by a military vessel. Greek authorities urged the public to contact them if they are looking for loved ones but many people took to social media, posting pictures of those they were looking for and their last known location before the fires hit. Fire service spokeswoman Stavroula Malliri announced Tuesday afternoon that the death toll had jumped from 50 to 74, with another 164 adults and 23 children injured by the fires. Of the adults, 71 remained hospitalized, 10 of them in serious condition, and 11 of the children were also still hospitalized. Twenty-six of the dead were found at first light Tuesday huddled together in one compound near the sea in the community of Mati, near the port of Rafina. Red Cross rescuers who found them said they appeared to be families or groups of friends, as they were found hugging in groups of threes and fours. With the flames whipped up by shifting gale-force winds, many tourists and residents fled toward the coastline. Some swam out to sea, braving rough water and strong currents to escape the ferocious flames and choking smoke. The speed of the fire's advance took many by surprise. "It happened very fast. The fire was in the distance, then sparks from the fire reached us. Then the fire was all around us," resident Nikos Stavrinidis, who had gone with his wife to fix up his summer home for a visit by his daughter, told the Associated Press. Stavrinidis, his wife and four friends swam out into the sea to escape the smoke, but they quickly became disoriented, losing sight of the shore and being swept out further by the wind and currents. Two of the group didn't survive. "It is terrible to see the person next to you drowning and not being able to help him," Stavrinidis said, his voice breaking. The remaining survivors were picked up by a fishing boat with an Egyptian crew who jumped into the water to rescue them. Passios said he and his wife stayed by the sea for two hours. "It was unbelievable. Gas canisters were exploding. Burning pine cones were flying everywhere," he said. When the flames died down, Spyros Hadjiandreou went searching for loved ones. "My niece and cousin were staying here on holiday. I don't know if they made it out," he said. "I don't know if they are OK. I haven't heard from them." The two wildfires near Athens broke out in pine forests Monday during the hot, dry summer conditions. Fanned by gale-force winds, the flames spread rapidly into seaside towns. "The police tried to direct us away from the fire, but we couldn't escape it," said Aleka Papariga, a former Greek Communist Party leader who lives near Rafina. "We got stuck in traffic and the flames were on top of us. We managed to find a small gap and we made it out." Evangelos Bournous, the mayor of Rafina, blamed the strong winds. "We were unlucky," he said. "The wind changed and it came at us with such force that it razed the coastal area in minutes." Rafina's dock became a makeshift hospital overnight as paramedics checked the survivors, some clad in only their bathing suits, who emerged from coast guard vessels and private boats. In all, 47 brush and forest fires broke out across Greece on Monday and early Tuesday, with most of them quickly extinguished, the fire department said. To cope, Greece sought international help through the European Union. 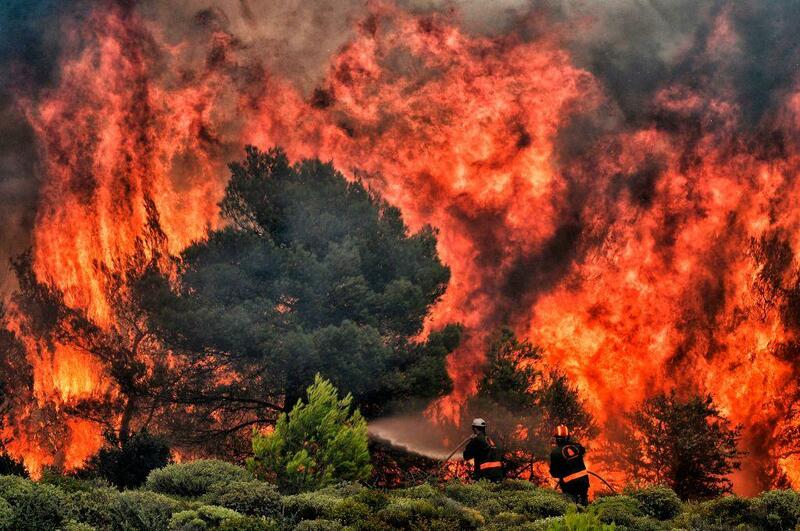 Spain was sending two firefighting aircraft while Cyprus was sending in 60 firefighters. Israel, Turkey and Bulgaria also offered assistance. Heavy rain was forecast across southern Greece on Wednesday, with hopes they could help in the firefighting effort. Forest fires are common during Greece's hot, dry summers and temperatures recently reached up to 104 Fahrenheit.